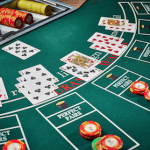 There’s a huge number of online blackjack games available to play for real money, but there’s only a small selection which you absolutely have to try. We take a look at the most entertaining 21 games on the web and detail where you can play them. To sign up to any of the blackjack sites from the above table, simply click on the links and register your details to access an array of premier online blackjack games. For American players whose choices are limited when it comes to the online casinos they can play at, you won’t be able to play for real money at any of the international casino sites discussed below. We recommend you give BetOnline Casino a go – this site offers a range of blackjack game variants especially designed for USA players. Felt Gaming is only new, and has only just been rolled out at some of our top online casinos including Aussie themed casino, G’day. A full range of blackjack games have been added, but we recommend the 6 in 1 title as it offers six possible side bets to be placed – you can place just one, or all six if you wish. These side bets include the Buster Bet, where players can win if you pick when the dealer will bust (pays up to 2000:1), Lucky Lucky Bet, where players win if the dealer’s up card and the player’s first two cards all amount to 19, 20, or 21 (pays up to 200:1), Lucky Ladies Bet, where player’s first two cards satisfy specified combinations (pays up to 100:1), 21+3, where the dealer’s up card and the player’s first two cards create a Three Card Poker hand (pays up to 100:1), Suit ‘Em Up, where the suit of the first two cards are the same (pays up to 50:1), and finally Perfect Pairs, where the first two cards are a pair (pays up to 25:1). Players can play up to three hands, each offering the six side bets too, with standard European blackjack rules applied. The minimum bet is $0.10 for all blackjack hands and all side bets, while the maximum available is $500 per blackjack bet and $250 per side bet. Try this title out at G’Day Casino and receive your first deposit matched by infinity with their unlimited welcome bonus. Play’n Go are one of the best providers when it comes to mobile games – but you will find this title is not only amazing on smartphones and tablets, but desktop and laptops too. 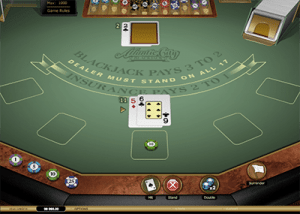 It is a standard blackjack game with European rules, but you can play up to three hands at once – whether at home or on the go. Additionally, six decks of cards are used but the house edge is still quite low – provided you use the basic strategy – at 0.63%. However, this title isn’t for the faint hearted blackjack player as there are some challenges. You can only play your hand once, there’s just one additional card dealt after Splitting Aces, Surrender isn’t available, and a hand which totals 21 can be beat by Blackjack. This is an incredible title for the real blackjack player who wants to take their game with them wherever they go however. Minimum bet per hand is $1, while maximum available is $100 per hand. If you want to be challenged by this title, head to Guts.com to play and you will receive up to £300 in matched deposits as a new real money player. 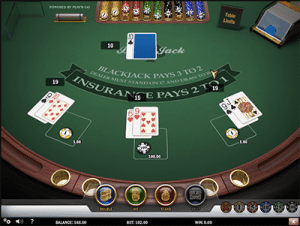 This live dealer game by Evolution Gaming is incredibly unique compared to the standard live dealer blackjack games as it features two human hosts instead of the one. This creates an incredible social atmosphere, without you needing to do anything. While American rules are in play, it might be worth it if you’re after a social ambience. You can chat to these hosts via the chat feature, and take a seat at one of the seven available. If there aren’t any seats you can opt for the bet behind side bet while you wait. The table limits for seated bets is $5 up to $1000, while bet behind offers a minimum of $0.50 and a maximum of $100 per bet. Head to Guts Casino on your mobile or desktop device to play this title in real time – and score up to £300 in matched deposits as a welcome gift. Blackjack Switch by Playtech is incredibly unique and exciting. It kicks off with players being dealt two separate hands. Players can then choose to switch the second cards of each hand as well as opt in for a side bet, known as Super Match, where players bet on pairs or similar suits. 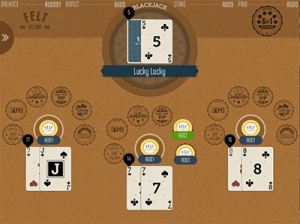 Blackjack only pays 1:1 here since you are improving your chances when switching cards, and you can only split twice. 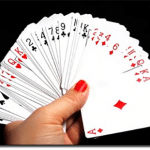 Additionally, if the dealer has 22 it is a push if the player has 21 or less – but if the player has Blackjack they win. The minimum bet per hand is $1 and the maximum is $200. Atlantic City has its own version of blackjack and you can play it online thanks to Microgaming. 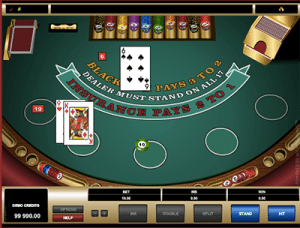 The hole card blackjack game relies on American rules and while you can play the standard version at All Slots too, the Gold option provides superior gameplay and graphics. 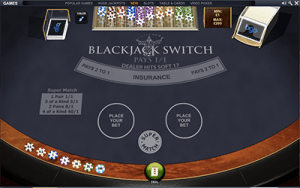 Two important rule variations from hole card blackjack on this title includes eight standard decks in play – the most available out of Microgaming’s full blackjack suite – and Late Surrender is available. Minimum bet available is $1, while the maximum is $100. Play this classic variant at All Slots Casino and receive a $1600 welcome bonus as a new player. While it may be last on our list, Microgaming’s Classic Blackjack is considered to be the best thanks to the incredibly low house edge available when playing the perfect basic strategy. The house edge can get as low as 0.13%. With just one standard deck of cards in play, this title is on the other end of the spectrum featuring the lowest number of decks in Microgaming’s blackjack suite. This is very beneficial to the player as it reduces the house edge. What’s more blackjack still pays 3:2. The minimum bet available is $2, while the maximum is $200. Head to Royal Vegas Casino to play the basic strategy and receive $1200 in matched deposits as a welcome bonus.